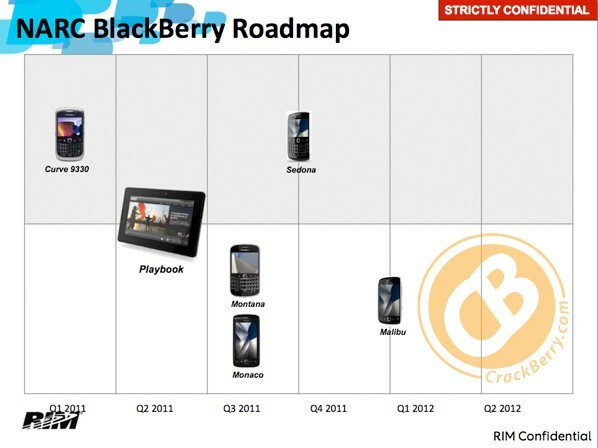 CrackBerry looks to have just gotten the inside scoop on everything RIM has planned for the CDMA side of the wireless divide in 2011 -- and as usual, it seems they'll be supporting it just as well as they do the GSM guys. Going chronologically, first up will be a CDMA PlayBook in the second quarter of the year; so far, Sprint's WiMAX version (sans CDMA support) is the only carrier-partnered version of the tablet announced. Next comes Montana -- a CDMA version of the Dakota -- which may come to market as the Bold Touch; as the name implies, you can expect the classic portrait QWERTY Bold form factor with the addition of a touchscreen. Look for that one in the third quarter alongside the Monaco (pictured above), which looks like a much sleeker Storm successor featuring a 1.2GHz Qualcomm core, a 3.7-inch WVGA display, and a 5 megapixel camera with HD video capture. Next, we'll get a CDMA flavor of the Apollo dubbed Sedona, a next-gen Curve with NFC support; that'll happen sometime around fall. Finally, looking into early 2012 we'll get a device codenamed Malibu that looks to be a full-screen Curve Touch with slightly lower specs than the Monaco. On the technology side, most of these new devices will be adopting a handful of technologies not seen on BlackBerrys before, including digital compasses, NFC, HD video recording and "management," and better HTML5 media support; they'll also be getting OpenGL support, mobile hotspot capability, 24-bit color, a better web browser, and an overhauled virtual keyboard by way of BlackBerry OS 6.1, which should be present in everything that gets launched here. Caught up? Given the lack of dual-core processors here -- the kind of CPUs Lazaridis says he needs to drop QNX on phones -- we'd say "no," but they might be getting within earshot. Follow the break for a shot of the full roadmap.